It took a recession, but Americans have finally figured it out: Buying magazines at the newsstand is a bad deal. If you have to have them, you can get them more cheaply via subscriptions -- or even for free. 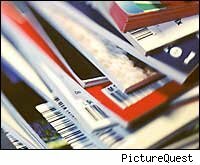 Single-copy sales of magazines were down 12.4 percent in the first half of 2009, according to a Monday report by the Audit Bureau of Circulations, the industry body most publishers use to verify their sales claims. That's a far steeper drop than was recorded in the same period a year earlier, when newsstand sales fell 6.3 percent. The fall also marks an acceleration from the second half of 2008, when the rate of decline was 11.1 percent. And for many of the biggest titles, the numbers were even worse. Only one of the 25 top-selling newsstand magazines -- Real Simple -- was able to eke out a gain in single-copy sales, of 1.2 percent. Meanwhile, 13 of the 25 saw double-digit percentage declines, with the biggest falloffs coming at women's-interest and celebrity titles like Family Circle (-22.6 percent), Woman's Day (-22.4 percent), OK Weekly (-20.4 percent) and In Style (-20.1 percent). Overall industry-wide circulation was down much less sharply, a mere 1.2 percent, suggesting that publishers countered their losses at the newsstands by increasing their reliance on subscription-sales agents. Paid subscriptions, which account for the great majority of magazine copies sold in the U.S., were up 0.6 percent. Meanwhile, many of the largest magazines also cut their losses by adding more "verified" subscriptions, for which consumers pay nothing. Newsweek was one of the heaviest users in this regard, nearly tripling the number of verified subscribers on its rolls, from 71,000 to 205,000.